I have a confession that might shock you. This toolkit that I have here, well, it’s not all online and virtual. In fact, here’s a picture of my real toolkit….er, toolkits. It’s filled with articles, book chapters, my curriculum, notes, ideas. Truthfully, it sits in my house taking up space, until I need it. But I feel comfortable knowing it’s there because I created it. It was a way for me to take a more active, reflective and personal role in my learning journey. True it’s a lot of information, but to compile it I had to sift through and find what resonated, applied – what mattered to me. Shouldn’t that be what all learning is about? In this age of information overload – learning at work needs to be more relevant, personal and applicable than ever – otherwise how can we retain it all? 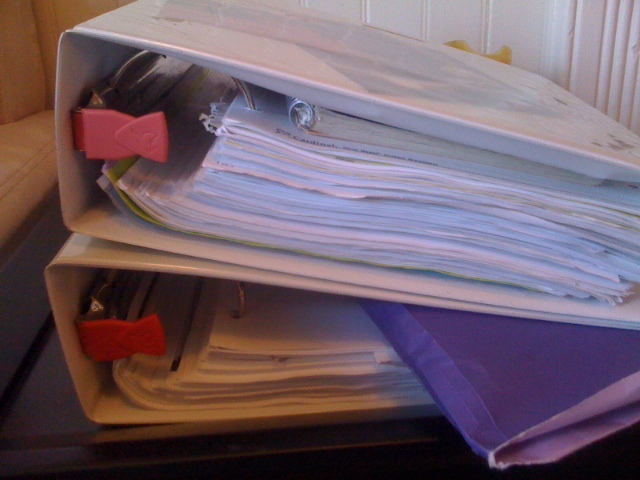 I often come across professional development opportunities where participants leave with a pre-made binder filled with articles chosen for them, answers filled out, and way too many case studies. Companies seeking compliance may sleep better knowing the “tools” have been handed off. But we can do more than just check learning off a list. We can make learning relevant, personal, and applicable. Make it easy to digest, give learners the opportunity to control their learning – even ask them to compile their own toolkits. Information that sticks with you is information you seek out and have a general interest in. Build the toolkit, feel safe knowing it’s always there to come back to, and give learners the opportunity for autonomy and mastery in order to help them be more engaged. This entry was posted in Employee Engagement, Instructional Design, Professional Development and tagged adult education, emerging workplace, instructional design, learning, professional development, training by Lindsey Caplan. Bookmark the permalink.